One of the key features that many high-end Nikon DSLRs hide in their menu system, is the ability to instantly zoom into an image at 100% zoom, or 1:1 magnification. 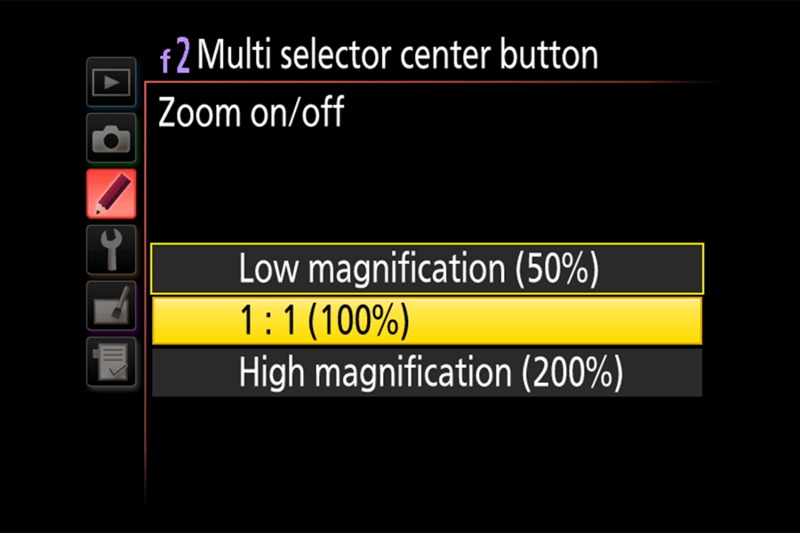 This “one-click zoom feature” can be very useful when reviewing images on the rear LCD, as it saves you from having to press the zoom and the navigation buttons so many times in order to see whether the subject you are capturing is sharp or not – you simply press the center button (which is sometimes marked as “OK”) on the multi-selector and you instantly zoom to the area you focused at. Press it again and you go back to full view. If you shoot with a high resolution camera like the Nikon D810, it will save you a total of 9 zoom presses. Let’s take a look at how you can enable this awesome feature on your Nikon DSLR. First of all, it is important to point out that the one-click zoom feature only works on higher-end and top-of-the-line Nikon DSLRs. Unfortunately, despite the fact that it is a firmware feature, Nikon does not want the owners of entry-level cameras to be able to take advantage of this time saving tool. So if you are wondering whether your camera can do this, you will first need to check the table below and see if your camera is listed. Second, the implementation of the one-click zoom feature differs on older cameras like the Nikon D700, where you might not have the 1:1 view option and might need to pick between “Low”, “Medium” and “High Magnification” instead. And lastly, you can use the one-click feature in combination with the rear dial – once zoomed in, if you rotate the rear dial, you can move between images while preserving the same level of magnification. This can save even more time when taking pictures of the same subject and comparing sharpness between images. In order to enable the one-click zoom feature, you have to navigate to the “Custom Setting Menu” and find the appropriate sub-menu. The name and the location of the feature is going to be slightly different depending on the camera you have, so please refer to the notes and the video below for more details. 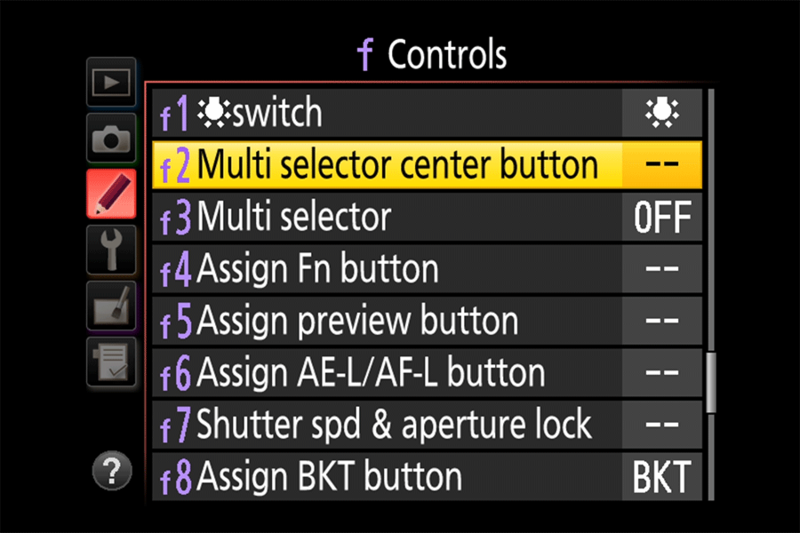 Select “Multi Selector Center Button”. If you have a DSLR such as the Nikon D7100, D7200, D750 or Df with the center button marked with “OK”, the menu name will be “OK button”. Select “1:1 (100%)”. On older cameras such as the Nikon D700 and D3-series and some cameras like the Df and D4-series, the recommended choice is “Medium”. Hope you find this a useful feature to enable! So strange that this feature is not available on the D600/D610! Brian, yes, and considering that it is a simple firmware feature, it is very disappointing that Nikon keeps it away from a number of cameras, including the D600/D610. I am very curious, why this very useful feature isn’t available on d600/610. Mainly because it is not something saved only for high end cameras and secondly it can be added via newer firmware easily. In the end, this is the only thing I am missing. Lukas, it is definitely annoying that Nikon kept it away from the D600 and D610 cameras. Should be a quick firmware fix, but Nikon wants to keep that feature to higher-end cameras. Kind of stupid, because it is a full-frame camera – even the D7200 has this feature. It definitely saves few extra clicks. Not sure why Nikon cannot have this feature available for lower end cameras if it is a firmware upgrade. Some learning they need to have from Fuji. Himanshu, I agree – Nikon should definitely learn a lesson from Fuji when it comes to firmware updates! Nasim, Thanks for the brilliant tip!!! Having a D800E for the last 4-5 yrs and using this function of trying to assess images in the field – your “one step tip” is definitely an ace to use and keep. Thank you Nasim – this is why I follow your site so closely. You are most welcome Peter! Fantastic! Thanks for the many saved clicks! Pierre, Canon has had this feature for a while too and it works really well. Perhaps I can do another article on how to do the same with Canon – it is really easy and also saves many steps to zoom in. The D4 also has just the low, medium and high settings. Don’t know about the D4s. This is a great tip! Thank you. Barney, yes, the D4 and the D4s work just like the older Nikon DSLRs, with no 1:1 magnification option. I updated the article to reflect this information, thanks for letting me know! Wow! This was the find-of-the-month tip for me. Can’t tell you how much time I’ve wasted pounding the ‘+’ button in order to check for sharpness on a just-taken image. One note however, the Nikon Df was not given in Nasim’s list but it is in fact implemented on my version of the Df. Joe, glad you found the article useful. Yes, the Df indeed has the same option and it is funny that I completely forgot it in the list of cameras, since the camera is literally sitting right in front of me on my desk! Love the Df and my wife refuses to shoot with any other Nikon DSLR. The Df has this feature as well. Bill, I updated the article to reflect this. Thanks for letting me know! thank you. i did’nt know it even after so many years…. You are most welcome Udayan! Great Tip! It’s working now in my D750. Presently (today 15 march 2017) in Amazon Spain, D610 (body only) is still 390.93 euros (415,89 dollars) more expensive than D7200. (1.339.93 versus 949). So I don’t understand Nikon’s policy with this matter. Juan, I don’t understand it either – it is hard to comprehend that a full-frame camera would not be qualified as a “higher-end DSLR” to gain this simple firmware feature. Nikon marketing sometimes makes no sense whatsoever! Very helpful! I love your website. You are most welcome Lucy and thank you for your feedback! After going through the steps several times, it still will not work on my D750. Bruce, not sure why it is not working on your D750 – are you pressing the right center button? You have to play an image, then press the center button in the middle of the navigating buttons that shows “OK” on the back of the camera. This has to be one of the most useful tips I’ve seen anywhere, for a very long time. What a time saver it is. Thanks so much. You are most welcome Paul, glad you found the article to be useful! As Joe Lundy and Bill Klein have said, the Nikon Df also has this feature [Nikon Df User’s Manual, pages 261 and 262]. On some Nikon DSLRs, including the Df, “Nikon’s One-Click Zoom Feature” can also be selected to operate in Live View mode. I updated the article with the Df added. Muhammad, who said that it will be bought by another company? I really don’t see that happening. I am invested in Nikon and I don’t feel like the company is failing. Sure they are struggling financially, but who isn’t? Canon is hurting big time too in their camera business. I would give Nikon a bit more time to figure things out – I am sure they have some great cameras and lenses planned for us. As mentioned above me the Nikon Df also has this feature. It’s f2 in the menu items OK button. It has low, medium, and high choices. I have mine set to Medium. It’s wonderful and so time saving to zoom in with just one click of the button to check focus, and clarity. I first learned of this feature when I bought my D300s many years ago. I’ve been using the feature since, and it’s one of the pre-requisites I have for my personal camera upgrade path. Strange that Nikon would add this feature to the Df and not the D600/610. Awesome Tip! This is what I love about Nikon, they share great features on other models. Sometimes it needs a workaround but YES- we got that 100% zoom feature. Thanks! You are most welcome JJ! The D2H, D2Hs, D2x and D2xs have the zoom feature as well. Works great! Thanks for letting me know Erik, I updated the article with this information. These correspond to 50% view, 100% view, and 200% view. So the D700 does have a 1:1 view but it has a different label. Thanks for the tip Nasim, the D7100 Also has the ” low, medium and high” magnification. I’ve been using this feature on my D300 and D750. It’s indeed a very useful and time saving feature and should be included on all Nikon camera. Useful to check for sharpness and to check if anyone in the group photo close their eyes. I used this very useful feature on my D300 and now use it on my D750. After watching and following your video on sensor cleaning using the Eyelead gel stick I used this feature to check for dust spots after cleaning. This was my first attempt at sensor cleaning and was very nervous. I found one little spot and am now trying to decide whether or not to clean again. In the video you used the zoom button but did not zoom in to 100%. Is a small dust spot, visible at 100%, something to worry about? Guess I will take some sky shots and see if that spot shows up. You show this tip to me during your 2015 Colorado Fall workshop, but I had a hard time to recall it after came home due to my old age. This article really helps many Nikon users, including me. Thank you and I surely had a great time in your Fall-color workshop!! Just for reference, the three choices on the D7100 are 6, 8 and 9 clicks of zoom. I don’t know whether the medium or high setting is closer to 100% but medium works pretty nicely. Once you’ve done the zoom you can use the plus and minus buttons to change it. That modification will remain as you go through the images with the rear wheel. Thank you very much Nasim for the very useful tip. I have already implement it in my D700. Thanks for always providing useful tips. Unfortunately I can not find this on my D5000. Could very well be a user error but if anyone else figures it out please tell me! Yes it WAS a user error… D5000 isn’t on the list. D’OH! I’ve used this feature for a while now, and was away when I read the article. I noticed that my D800 only had Low Med High in the settings. And still have Low Med or High to select from. Have I missed something here? If I have, whats your recommendation to use, Low, Medium, or High? Does anyone know if this function was removed with the latest update? I used to have this setting on but it no longer does so and I can’t find it in the menu. My Nikon D750 is updated to the last firmware update, what I guess is “C 1.12”, and in the “f1” part of the configuration menu I read (in Spanish) “Botón OK”, that is, “OK Button”, where you can enter and decide what to do when pushing that button. I hope it helps, unless you are using a different model. Thanks so much for this fix. I had accidently deactivated this mode and could not recover it.